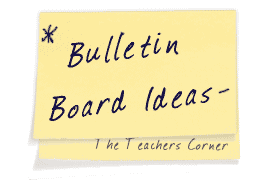 Our Student Work Bulletin Board Ideas page will provide you with great resources for a number of student work related topics. Our bulletin boards will help you integrate various activities into your daily curriculum. Ideas within the student work bulletin board pages include resources for the following: star students, self-esteem, and student work displays. Each week, my students earn one die cut star for star behavior. They write their name onto the star (in their best writing). I then place it on a bulletin board that I have decorated with a star border, a giant star cut out, and the words STAR PEACE PALS on the board. Once the board is filled, the stars go home and we begin again! I make sure to tell the parents the importance of the stars and if their child takes them home it's because they were superstars in the class. I have a small bulletin board in my classroom called the "I Was Caught Doing Something Good" board. About two to three inches in front of it, I suspend a fishing net from the ceiling. I printed up some 'I Was Caught Doing Something Good' awards on my computer (not big, maybe 2" x 8") that gives the date, the student's name and what I caught them doing. The students earn these awards by sharing with their peers, remembering homework assignments, etc. When they receive their slip, the put it in the fishing net and at the end of the week we hold draw. The winning student receives a new pencil and a large certificate for being the "Student of the Week". The kids love it and it's a bulletin board that stays up all year long! I found some great material at Wal-Mart (they've got tons of school related material at about $4/yd). Mine is dark blue with apples, 123 and ABC's on it. I'll spray it with "stiffener" so it holds up well (it works! I tried a small patch) Staple it to the wall and divide it into sections for each student using a heavy red yarn. The border is ready made apples. I'll also use one apple in each square with the child's name on it. The title will be "Our Best Work" or something like that. Each week, the students will select work they are proud of and we'll display it. The board will stay up most of the year so I don't mind the extra work and expense. I know they love having their work on display so I think this will work well. What I have done for the personal space bulletin boards is to use a piece of construction paper for each child. Make a small slip at the top middle and attach a paper clip (tape the back so it does not move). Each child gets a rectangle (piece of paper) to do with as he likes. These papers can be put together as a bulletin board or all over your room. The title of my board was "Something to Smile About" and I used smiley face border. I have also seen teachers who make silhouette and then post the children's work on the faces. I have 2 'ongoing' boards appropriate for a hallway or classroom. 1. On the long board in the hall where our 6 classes are located, I have put up a W.O.W. board. I traced the giant letters using an overhead projector and 'packaged' letters, onto large construction paper. I then decorated each letter with shiny foil stars, and put them in the middle of the board, vertically. After the W, I put 'onderful' using the 'packaged' letters, 'utstanding' after the O, and 'ork' after the second W. I then mounted several pieces of colorful construction paper to 'frame' some of our students papers, with room left for other items, such as projects. Students work is changed frequently, but the board and letters stay up all year! 2. In my room, I have a 'semi permanent' RE board. I again use the overhead to trace large RE letters onto colorful paper that matches some packaged letters, which I use to finish the words (re)fresh, (re)mind, (re)call, (re)member and (re)view coming out from the large RE letters. I then type out some questions and answers from material we've covered during the year, usually with a colorful border. I display these for a week or 2 and then replace them. We sometimes conduct an oral review using the board!